Let's have shots of your favorite Irish beverage this "St. Patrick's Day" and after emptying the shot glass, you can just let go and it will still be hanging around your next waiting to be used when you're ready again. 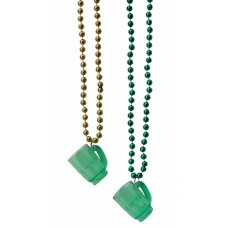 The 7.5mm 30" green and gold metallic beads each have a mini mug shot glass made of green plastic attached. Great for that Irish event where you want everyone to get a shot. We love to drink with the Irish. 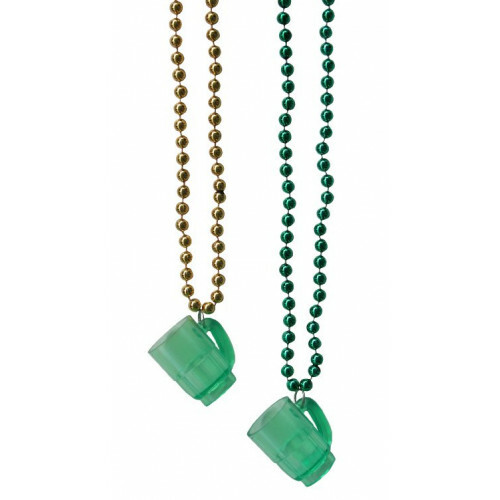 These beads are perfect for St. Patrick's Day parades and events or anytime you want to show some Irish pride! These beads are available in 3 dozen bags and 30 dozen cases.